Depending on where you’ve come from, the rubbish system in Japan can either be amazing, or daunting (or some combination of the two). Due to a large population, and limited amounts of land, Japan has adopted very enviable recycling programs, with much of the heavy lifting being performed by the individual. It can be the cause of much confusion for people new to Japan, but there isn’t anything too complicated once you get used to it. Garbage is sorted into several different categories, including simple ones like food waste, paper, plastic, metal, glass as well as initially less clear categories, like burnable and non-burnable. These two provide a fair amount of confusion, as common sense usually says that plastic isn’t something that should be burnt, but in this instance, it refers to garbage that is soiled (tissues, dirty plastic, comingled paper/plastic items etc) and is physically able to be burnt. These items are then turned to ash using very high temperature incinerators – which reduce the harmful by-products, such as dioxins. Non-burnable waste is the other items that will not burn (electronic toys, ceramic, mixed metals etc) and not covered by separate recycling categories, which eventually ends up in landfill. This sorted garbage is put into separate bags and is put out into the rubbish collection cages the night before it is collected, with different categories of rubbish being collected on different days. Now, this is where the confusion (and controversy) begins for people in Hirafu. These collection cages used to be dispersed throughout the village, but for several reasons (abuse, improper use and funding) they have been removed. People who are registered as residents here in Kutchan are able to register with the Kutchan town office and take their sorted and correctly bagged refuse to Sun Sports (just outside of Hirafu on Route 343 towards Niseko Village). This strictly controlled garbage disposal system (and, if you don’t believe me, you’ve clearly never encountered a gomi witch before) is one of the reasons that it can be difficult to find public garbage bins in Japan. You may have even noticed that some convenience stores actually keep their bins inside – this is to stop lazy people dumping their household garbage in their bins and making it someone else’s problem. But, for most people staying in Niseko, the garbage is collected and disposed of by their accommodation providers, without much thought having to go in to it. Sadly, due to the fact that much of this garbage is unsorted, most of it will end up in landfill. 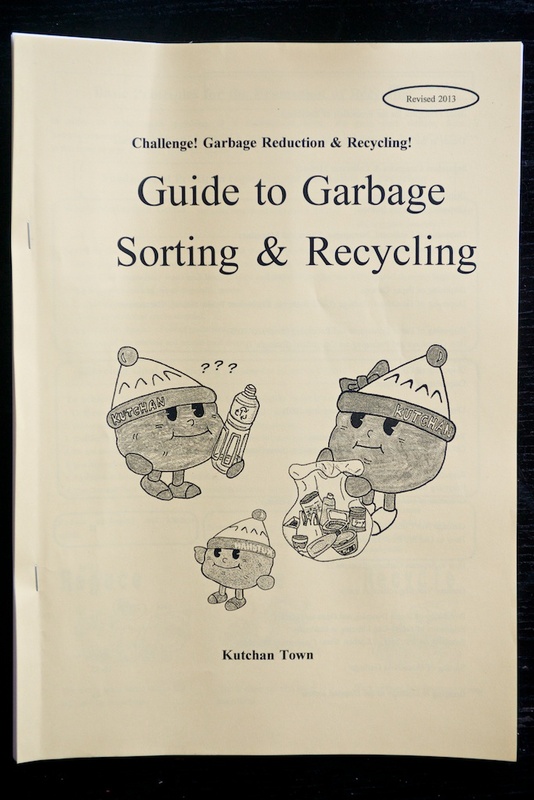 Kutchan town office has produced a very illuminating and extremely thorough guide for new residents to the town to help them learn how this important process works. 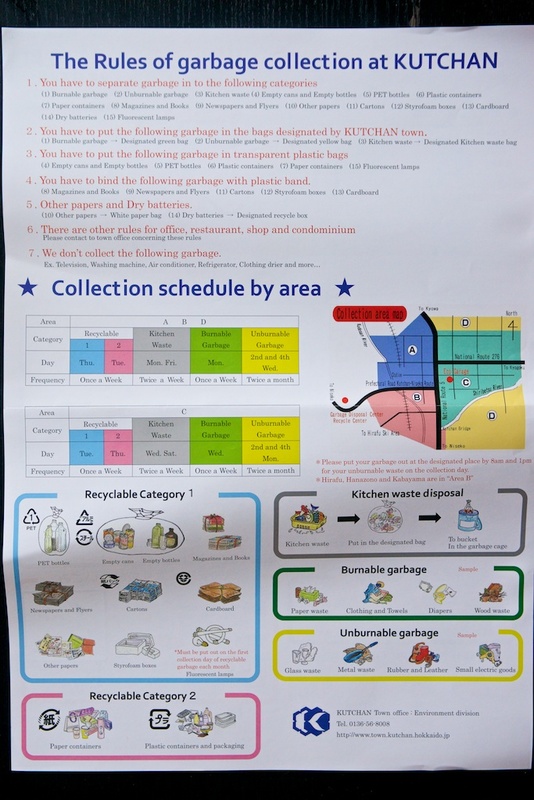 They are available from the Kutchan town office, as are posters that help illustrate the sorting process. Hopefully this has shed some light on the process, and maybe now you will understand why there are so many bins in your accommodation, or why the bins at Seicomart are categorised into burnable/non-burnable, or why the bins in Lawson are inside the shop. Hahaha! Great post! I must admit, I did find all of these things befuddling when I visited last year!! Thanks for the informative post! Hi Rob – we are not sure might be best to ask a service station. Thanks Glen, got it sorted through the Dunlop outlet.